Let's talk about Taz-Mania. You did the opening theme for the show (which was very nice) as well as two episodes. 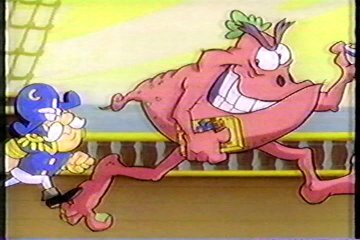 Both of them had Bullgator and Axl cartoons--"Instant Replay" and "Hypno-Tazed". I loved those guys and they looked great under StarToons. "Taz" was an interesting new project, for various reasons. First, it meant I was working with Art Vitello instead of Ruegger. Ruegger had too much other stuff going on, plus Vitello was a very talented veteran and he had a lot personally invested in this project. Secondly, the series used flat BG's, which meant they could be drawn, xeroxed, and painted just like an ordinary cel level. This shaved some numbers off the budget, which was important - these shows had to look good, but cost less than Tiny Toons. Another way they cut corners was in the musical score, using something like a 5-piece band, instead of a full orchestra like they did with Tiny Toons (and Animaniacs). Our first assignment of course was the opening, which was a helluva lotta fun to do. Then we did production on two shows, which you've noted. Later Kirk Tingblad and I also helped out on timing many of the other shows. 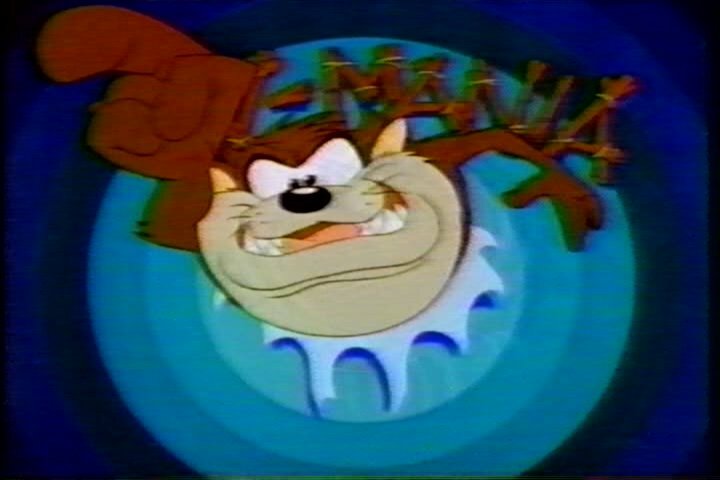 The opening Taz-Mania animation had a LOT of flashing...did you have to follow careful notes to make sure nobody got a seizure? Also, was the layout for the opener planned for you or did your team invent most of what goes on in it? First of all, when we got the storyboard and the dope-sheets for the opener, I was really impressed. Vitello did the sheet direction himself, and I've never seen more thorough dope-sheets in my life. They were extremely tight - there was no guesswork for me at all. I animated the entire thing myself ... which as I recall is one reason why I couldn't put too much time into other projects at that time. The color flashing was precisely as per Vitello's sheet directions, and I thought it looked really dynamic, very electric! I had actually heard rumors at that time that flashing color screens could cause epileptic seizures with certain people, but I also knew it had been done before (I had used the technique myself on other cartoons), so I figured I'd leave it to WB's legal department to worry about it (if indeed it needed to be worried about at all ... I certainly never heard about any legal cases resulting from it). For the two shows (four cartoons) we did, we got our old friend Deane Taylor to do the layouts. They were wonderful as usual. You may recall Deane served as art director on Tim Burton's "Nightmare Before Christmas" in 1993. Incredibly talented guy. "Taz and the Pterodactyl" was brilliantly supervised by Spike Brandt, who animated that one long continuous shot in which the Pterodactyl (carrying Taz) flies thru clouds and cliffs, etc. It was an animation engineering masterpiece, carefully planned by Spike and well-executed by Ron Fleischer our technical director. The thing to remember when watching that is that it was all using traditional cels, not digitally, and yet we were able to give it a kind of a 3D feel. Ron used aerial image shooting and optical printing to achieve the needed results, techniques that were generally reserved for feature films and high budget commercials. The thing I remember about "Mum's N' Taz's" (I think that was the cartoon) was that in it, Taz is acting like a dog (can't remember why), and he's been fetching sticks and what-not, and so there's a shot where he's sitting on his haunches panting with his tongue hanging out, and I thought, what the hell, so I had him quickly bend down and lick his crotch (as dogs tend to do)! It got a big laugh from the Warners guys, and I believe it went to air that way, so I think that may have been a TV first, where the main character of a cartoon series gives himself oral-genital pleasure. Egad, you're right! It happens pretty fast, though. 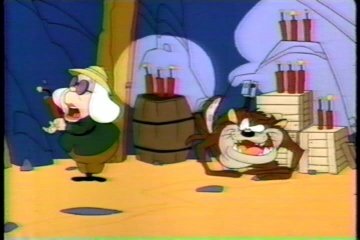 On a side note, I remember this scene having the slowest-burning sticks of dynamite in any Warner Bros. cartoon in history. They were burning for about 5 minutes, even longer if you count the time Mum and Taz are in the hole that we don't see. It's a LOOOONG payoff. They only explode when Bushwhacker Bob steps in--as if they were waiting for him. That was typical of Vitello's sense of humor. But we were really starting to have more than we could handle. The good thing was, a lot of the young animators were coming along. Kirk Tingblad was in place and handling a lot of footage, Spike Brandt was in fine form, Tony Cervone was ready to start animating, and the studio had settled into a nice rhythm even though it needed constant administrative attention. It was about this time that I spoke to my older brother Dave - the one who had told me as a youth that an art career would never pay off - about coming on board at StarToons to handle administration. Thankfully he accepted the offer. But the "thirteensomething" script was so nice, I couldn't pass up animating on it. I buried my head in this episode, and I remember a few enjoyable scenes where Shirley MacLoon whacks Plucky who is constantly hitting on her during this episode, and the bit where Babs arrives at the Chrysler Building in New York City and Letterman is yelling out the window, "I'm not wearing any pants!" and Babs looks down at herself and says, "I should fit right in!" And some of the attempts by Buster to find a replacement. The big scene, of course, was the 108 foot (1 minute, 12 seconds without a cut) split-screen phone conversation between Buster and Babs, who both really missed each other. It was full of intense emotion while they were trying to play it cool, so I enjoyed the acting challenge ... although it was of course based on the dialogue between Billy Crystal and Meg Ryan in "When Harry Met Sally" so of course there was great acting reference for that scene. I was actually able to finish rough animation for it in about ten days; but poor Mary Hanley did the clean-up and inbetweening, and it took her the better part of four weeks to finish. She was totally sick of that scene by that time! But it looked beautiful. Mary Hanley was the best draftsman who ever worked for StarToons; her only drawback, as I said before, was she took too many smoke breaks. The drawback was that in my enthusiasm to animate, some of our younger animators, including Cervone, weren't getting the guidance they needed. So mixed in with that show was some really wonky stuff. Nonetheless, when we finished it, WB was happy, and Steven Spielberg actually commented (they forwarded me his fax) that he thought it was the best Tiny Toons episode to date. Naturally we wanted to frame that. One thing you might want to check out in the Geraldo sequence is the audience. A lot of the audience members were caricatures of our animators and assistants, done by Kirk Tingblad. ...In that scene Babs says on the spur of the moment, "Excuse me, but you pronounced my name wrong. It's BabZZZZ-a." Buster changes the channel and every following TV show spoof is not only hilarious on its own, but features everyone stumbling over her name: "BAAAAB-ZUUUUUH!!" That one moment influenced my writing career more than any other TV moment at the time. The ones that come closest would be the "TV Executive" episode of Dinosaurs and the "Timmy O' Toole" episode of The Simpsons, which worked a similar theme: something they showed wasn't currently happening in real life, but if it was, that was exactly how it would go. I was young, but I was bright, and I knew an actual celebrity could decide to change her name's pronunciation tomorrow on a whim, and within the next 24 hours have every announcer and talk show host in the country struggling over it. I thought that joke was so sharp that it has stuck with me all these years, and the thought behind it has influenced a lot of my work. .....I guess this is more of something I should say to Sherri, if I ever find her. And I hope I do. Yeah I think it was around then that Demmy Moore suddenly became D'Mee Moore. Like, give us a break, kid. If you find Sherri, tell her I said hi. She was definitely one of the most talented people I ever met in Hollywood. There was also something called the "Plucky Duck Show" that year that only had a pilot produced, but Fox aired the pilot anyway and then just pasted together a bunch of Plucky cartoons for additional episodes. Fox really wanted a TT spinoff; there was this and then "Elmyra's Family." How close did either of these come to ever getting made? We were approached about the possibility of working on both of these, but they never came to fruition ... and I never heard the details as to why. 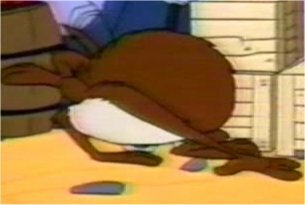 There was also the TT episode made and completed for season 3 that Fox never aired, "Toons from the Crypt." I'm sad to say that I've never seen it....Nickelodeon ran it, but I haven't had cable TV in a long long time. And in addition to THAT, there was an episode that FOX aired but NICK banned. You might have heard of it....Buster, Plucky and Hamton get drunk. I never did hear about this episode. My understanding was that Warner corporates considered 100 epsiodes the upper limit for production investment for any series ... after 100 episodes they felt they had enough material for reruns and DVD releases. That was a sad realization for us ... I would've happily kept making Tiny Toons until I died. There's one more thing to look at from 1992. A Cap'n Crunch ad aired that fall which looked a lot like your drawing style. Two kids doing a voice-over are complaining that the Soggies are lame, and they start replacing them with their own ideas. Like...CRUNCH-BERRY LARRY! "Crunch-Berry LARRY? I lost my Soggies for this?" I think it was the last ad in which the Soggies were ever used. Well, I beg ignorance. The drawings are nice, so I'm glad you thought I did them, but I didn't. 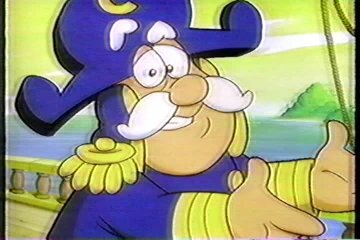 Tom Sinnott used to do the Cap'n Crunch spots, and the only cereal commercial I worked on was for a Tiny Toons cereal that came out for a couple weeks. Tom hired me to do the pose test (animatic) for the agency, and then Sinnott's boys animated it, pretty much using my poses as their key drawings. UPDATE: Someone who worked for both Sinnott and Associates and StarToons recently dropped an E-mail to resolve this mystery: the reason the Cap'n Crunch ad looks like a StarToons cartoon is because it was laid out, posed and animated by Spike Brandt. So...there's the answer. Thanks, John Griffin! Next: Animaniacs! Pre-production, Pip Pumphandle, and Minerva Mink!